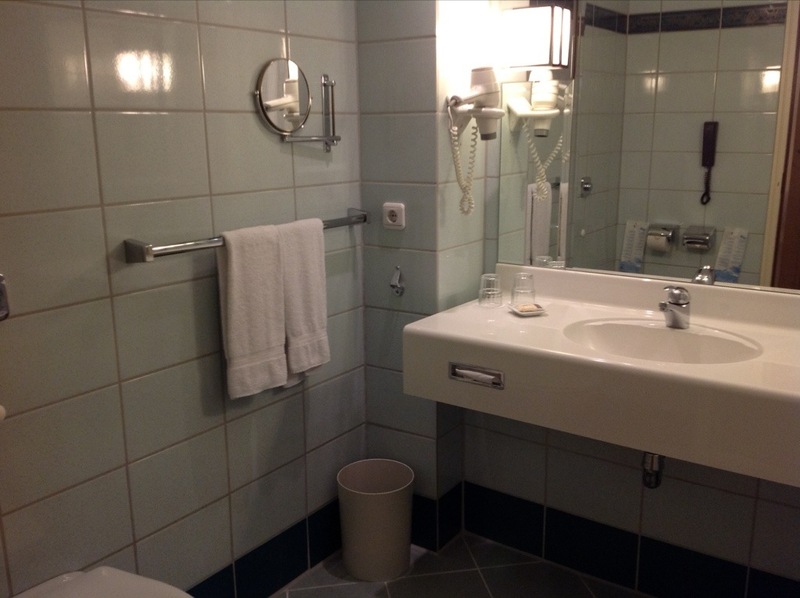 This is my review of the Sheraton hotel at Frankfurt Airport. Sunday was one of the weirder travel days in my life. We had been in Dusseldorf at a wedding for a few days. My original plan, after waving the rest of the family off on a train to my wifes parents house, was to take a leisurely 2 hour train ride to Frankfurt. I would then check into the luxurious new Jumeirah hotel in the city centre, take it easy for the rest of the day and then get the u-bahn over to the airport in the morning. A couple of days before we flew out, though, my wife started worrying about the plants in our garden, given the heat. She didn’t want them sitting there for a week with no water. She had also decided that she didn’t want to carry her dress for the wedding around with her. I was therefore told to cancel my original plans and to travel from Dusseldorf to Frankfurt via West London! As I have written before, I have one rule with airport hotels – only stay in a hotel directly connected to the airport. However worn or rubbish it may be, you simply do not want to be messing about with shuttle buses late at night and early morning. The Sheraton is attached to Terminal 1, so if you arrive on BA in Terminal 2 then you need to take the Skytrain. Annoyingly, there are no signs in T2 to tell you this. When I arrived at the Sheraton, it was everything I expected (ie not much). However, ironically, I felt at home! I was flying out to the US the next morning, and the Sheraton instantly brought back memories of many, many US holidays in years gone by. There is something about the furnishings and design that brought it all back. All I was missing was the ‘sanitised for your protection’ sticker across the toilet, which middle tier US hotels love to use! 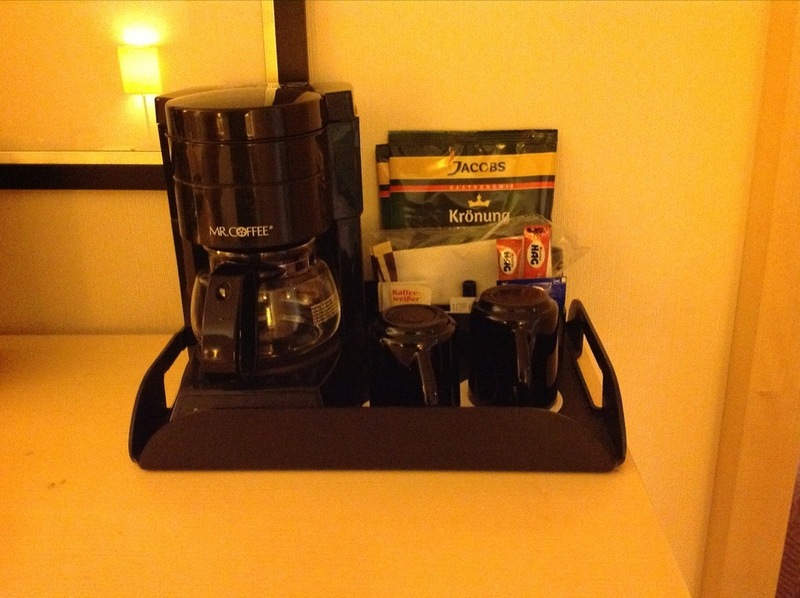 Yes, a Mr Coffee US-style coffee machine! The memories came flooding back! Here are a couple of other room photos. The bedroom and bathroom are as uninspiring as you would expect. No rainfall shower here! However, the TV had BBC1 on it (the wifi didn’t work, though) and that did the job for the short time I was awake. I am embarrassed to say that my Starwood Gold status has dropped back to Preferred Guest level – I hadn’t bothered to ring American Express to reactivate my free SPG Gold that comes with my Amex Platinum card. By the time I knew I was doing this stay, it was too late. I may therefore have been upgraded to something more exciting had I been Gold, I don’t know. 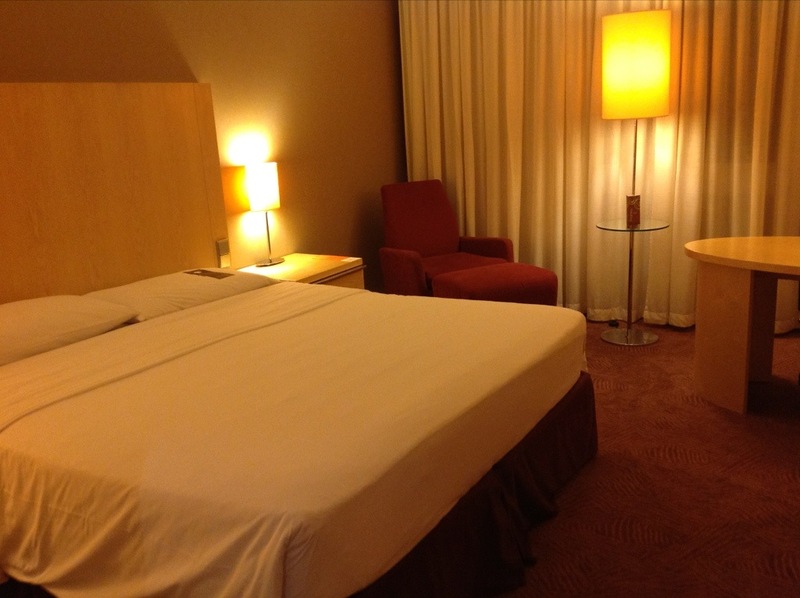 The Sheraton Frankfurt Airport certainly wasn’t a patch on the Radisson at Hamburg Airport that I used in February. It did the job, though. I left the hotel at 9am and within 10 minutes had walked over to Lufthansa’s First Class Terminal. I have to say Raffles you’re being very generous to that hotel which I think is possibly the worst and – perhaps not in this instance but usually – most incredibly overpriced airport hotel I have ever stayed in! Plus in my experience Starwood Gold doesn’t get you a lot. Double points is nice, but upgrade is rarely anything other than ‘a room with a slightly better view’. Compared to Hilton’s free breakfast and drink and guaranteed upgrade, or Carlson who have always upgraded me to something pretty nice, Starwood isn’t great. Who are you and what have you done with our Raffles????? Couldn’t agree more on airport hotels. Why anyone would stay off site just to save £100 or so is beyond me. Now take into account that many people use miles and hotel points for family holidays. The age of our kids means we have to book 2 rooms, Generally we only stay near an airport if we have to. £200 saved is a lot of money to a lot of people. That goes a long way to keeping teenagers happy on holiday. When I was free and single I didn’t care so much but now everything is multiplied. To be fair, for £100 saving I might get on a bus. It is rarely that much, though. Heathrow is an outlier because the Sofitel is new and lovely and the other hotels are generally dumps! I’d say it depends on how much the saving is, how much nicer the other hotel looks, and what the transfer option is. A frequent, short shuttle to a nicer + cheaper hotel is something I’d always go for. An infrequent, long shared shuttle with a late start and an early finish, so you’d probably need a taxi anyway, that’s a different story! £100 is a lot of money, at least to some people, it probably takes me about 5 hours to earn that much, having to take a shuttle bus twice for 10 or 15 minutes to save £100 would be a good deal as far as I was concerned. It takes me 15 hours work to earn £100 so I’m more likely to spend a night on the airport floor. I think the Sheraton was Euro 140 for cash, had I paid, so definitely not £100 above all the other ok options! And, yes, I know that using 10k SPG to save c£120 is not the greatest deal! So how did you get to the FCT, taxi? I walked. Hotel entrance is roughly by Departures in T1C. Walked into terminal, turned right, walked along to T1A, went down one level to arrivals and then walked the last 200m along the road and through the taxi parking area. and then walked the last 200m along the road and through the taxi parking area. I thought someone was having a laugh when they directed us along that road, which at the time was under repair . Do you still have to ring the bell and wait for assistance. Worse, the lift was broken so there was a sign on the door telling you to take the fire escape stairs up to the flyover road level! Luckily I only had a carry on bag. There’s also a Hilton and Hilton Garden Inn just a short walk past the Sheraton – I got a good rate at the HGI plus plenty of bonus points with a promo that was on. Agree £100 saving is significant – TBH I rarely want to pay >£75 for an airport hotel if I can at all help it! Raffles – You’ll be delighted to hear that London experienced torrential rainfall last night ! Yes, plus to put my wifes dress from the wedding back in the wardrobe to stop it getting creased during her week with her parents …. Obviously it made life slightly easier for me as well, as I didn’t have to carry my US stuff to the wedding, but I could have worked around that fairly easily. That bedding looks absolutely dire. I’ll be happy enough to take the free shuttle over to the Holiday Inn Frankfurt Airport North for a free night based on those images. Currently on a month long detox in Kuwait at the rather decent Crowne Plaza. No BRG but a snag on Point Breaks. Not yearning for a pint just yet, three weeks in, but I could murder for puddin and chips! I was told you were heading down there. Probably been hotter back in Manchester though! A perfectly pleasant 45 degrees today. Hotel offered me a suite (which I turned down as it was dated) as well as Club access and I haven’t spent a penny since I’ve been here. I’d struggle to as well seeing as everywhere is shut between 3am and 7pm, so the Club has come in handy. Free transportation too. I’ve got a fortnight at the IC Aqaba booked in too, following on from three nights in Al Ain and three in Abu Dhabi. Aqaba haven’t been forthcoming on the Club access front as yet, wanting £30 a day, which is rather on the pricey side for someone that doesn’t drink! I stayed at that Sheraton once…I agree it was quite poor value for money. Did it take you an age to check out? I found it took a good 10 minutes just to get myself processed at check-out time (and I don’t mean queuing time). Last time I had an overnight at Frankfurt Airport, I did take an off-site hotel using a shuttle bus and thought it was fine. £48 which meant I incurred a 10 minutes shuttle but the saving justified it…the hotel I stayed at wasn’t that nice mind. The real worries I have with off-site hotels is 1) will my flight arrive late, causing me to get a taxi that gobbles up my financial savings? 2) will I get stuck in traffic on the way back to the airport. I left the room key at the aircrew check-in desk next to the entrance and told them I was leaving! I hadn’t charged anything so there would be no bill anyway. Stayed here. I came. I slept. I woke up. Got ready & walked to my gate. That’s it. I’ve never stayed at a Sheraton before, looking at those pics I assume that Sheraton is the Holiday Inn of the SPG portfolio, or is it more like the Hilton brand that seems to cover everything from 3 to 5 star? The Sheraton portfolio is thinning out, especially in Europe. Brand is dying off here. I stayed in Salzburg, seen as the best Sheraton there is in Europe, and that was only ‘pretty good’ in my book. Basically, Sheraton I see as mass-market 3-4 star, Westin 4-5 Star (InterConti / Conrad clone), Luxury Collection and St Regis as 5-star Waldorf-Astoria / better InterCon clones. Sheraton’s, to my mind, tend to be big properties, though, whereas you don’t see many monster sized Holiday Inn’s outside Heathrow. The Edinburgh one is great. Newly refurbished, good free spa if you get a club level room and nice lounge. I forgot that one, yes you’re right, it is meant to be very nice after the refurb. The main London one (Park Tower) was reflagged a couple of weeks ago and is now a Luxury Collection property. The Sheraton Belgravia turned into an independent hotel called Belgraves a couple of years ago.